Remember before putting your tree outside take all the decorations, lights and any tinsel off the tree and dispose of separately. BEST SOUTHWEST—It’s the day after Noel, the gifts have all been unwrapped and the turkey is reduced to scraps. The question remains, ‘What to do with your Christmas Tree?’ Each Best Southwest city has a few rules to follow. Because Christmas Day and New Year’s Day fall on Sunday this year, there will be no interruption in trash service. 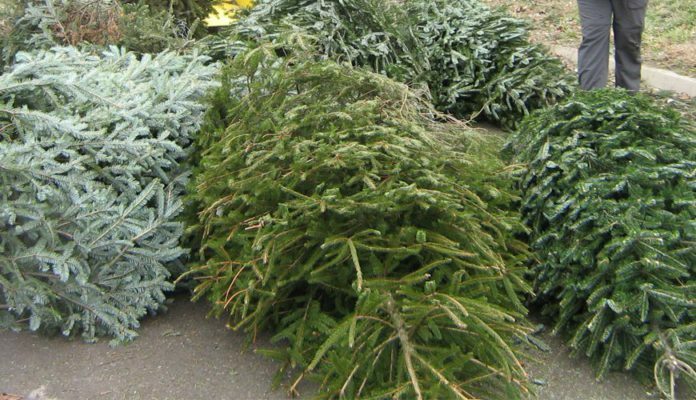 The city’s solid waste contractor, Republic Waste, will be collecting live Christmas Trees for recycling on Wednesday, December 28, 2016 and Wednesday, January 4, 2017. Place your tree on the curb in front of your home for recycling. Trees placed in the alley will go to the landfill. Be sure to remove all decorations and lights for recycling. Trees with flocking or artificial trees cannot be recycled. Place them with your regular trash for pick up. Cedar Hill’s curbside residential live tree recycling pickup is Tuesday, January 3 and Tuesday, January 10, 2017. Residents can set out, by the street, natural trees that are clean, without tinsel or decoration. There will be dumpsters for natural tree disposal at the Hillside Village Shopping Center and at the Sims Recreation Center.. If there are decorations on any tree in the load they will not be recycled, but diverted to a landfill. Dumpsters will be available from January 3 to 13, 2017. Place the tree at the front of the house by the edge of the street by 7 a.m. In case of snow, place the tree on top of the snow to increase its visibility. All artificial Christmas trees should be disposed as part of bulk during your bulk collection week. Failure to remove decorations or placing the tree in a plastic bag will result in the tree not being collected that first week and, consequently, the resident will have to wait until the following week. Trees placed out on days other than your trash day will be considered a code violation. Trees placed out after the week of January 16, 2017 will not be collected. The City of Duncanville will provide Christmas tree recycling beginning December 29, 2016 until January 31, 2017 at the Service Center located at 330 Shady Trail. Residents may drop off their trees in the grassy area by the existing mulch pile on Shady Trail near Main Street (there will be signage to direct you to the area). Christmas trees must be free of lights, decorations and cannot be in any type of wrap, especially plastic. The mulch is provided free to residents. For more informa­tion, contact the Service Center at 972-780-4900. The City of Glenn Heights does not have a Christmas tree recycling program. Therefore, residents are allowed to place their Christmas tree next to their trash containers on Wednesdays for disposal. They may also choose to bring their Christmas tree to the City’s Department of Public Works & Infrastructure at 2118 S. Uhl Road. The operating hours for the City of Glenn Heights’ Convenience Center/Station are: 1st Saturday of every month from 9 a.m. to 12 noon and every Monday (excluding approved holidays) from 9 to 11 a.m.